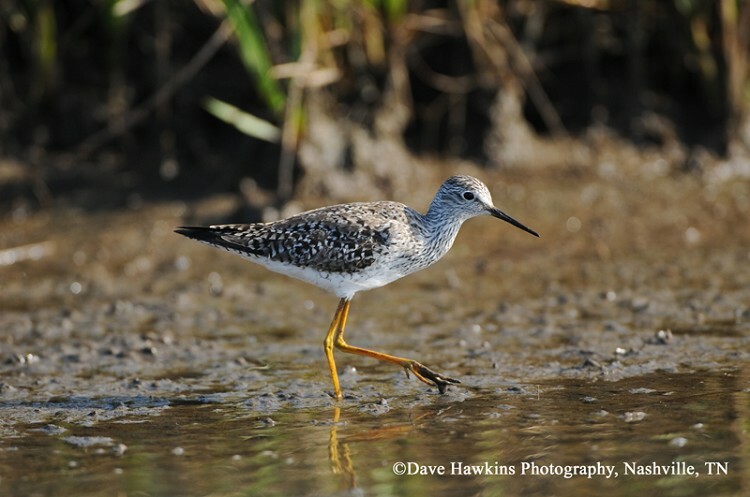 The Lesser Yellowlegs is a graceful, slender, medium-sized shorebird recognized by its bright yellow legs and distinctive tu tu call. It is an active forager, often running in shallow water to catch prey. The breeding range extends from central Canada westward through Alaska and they winter throughout Central and South America, the West Indies, and the southern United States. 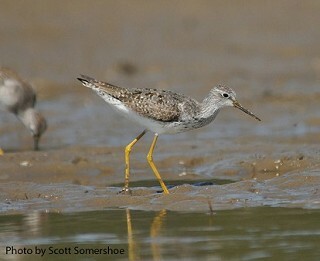 The Lesser Yellowlegs migrates through Tennessee each spring and fall and is fairly common in appropriate habitat statewide. Description: Medium-sized active shorebird with bright yellow legs, thin neck, long dark bill, an upright stance, and square white rump patch. The body is grey brown on top and white underneath; the neck and breast are streaked with dark brown. In fall and winter, it is grayer overall. Males, females and juveniles are similar in appearance. Bill length is only slightly longer than the length of the head, which is important in distinguishing this species from the Greater Yellowlegs (see below). Distinctive call can also be helpful in identification. Voice: Flight call is a two-noted short whistled tu tu, typically softer than Greater Yellowlegs. Also commonly gives an alarm call of kleet. Greater Yellowlegs has a slightly upturned bill with a blunt-tip, while Lesser Yellowlegs has a straight, sharp-pointed bill. Lesser's bill is always dark, while Greater's bill is grayish at the base in non-breeding season. Greater Yellowlegs has a proportionally larger bill that is much longer than the length of the head. Voice is best distinguishing character: Greater gives three or four piercing notes, Lesser two rapid, softer short whistles (sometimes or three). Solitary Sandpiper has greenish legs and a barred tail. Stilt Sandpiper is slightly smaller, has greenish yellow legs, and a slightly drooping bill. Habitat: Mudflats, sand bars, and lake and pond edges. Diet: Aquatic and terrestrial invertebrates, particularly flies and beetles; occasionally small fish and seeds. Nesting and reproduction: Lesser Yellowlegs has not been documented nesting in Tennessee. Status in Tennessee: Fairly common migrant statewide. They arrive in spring as early as mid-March and linger through May. The first southbound migrants arrive in early July and can be found through November. There are very few winter records. The global population appears stable. Best places to see in Tennessee: Typical shorebird hotspots are good places, including Cross Creeks NWR, Old Hickory Lake, Rankin WMA, Eagle Bend Fish Hatchery, places around Reelfoot Lake, among other places. Tibbitts, T. L. and W. Moskoff. 1999. Lesser Yellowlegs (Tringa flavipes), The Birds of North America, No. 427 (A. Poole, and F. Gill, eds.). The Academy of Natural Sciences, Philadelphia, PA, and The American Ornithologists' Union, Washington, D.C.